At the start of each of the 5 rounds, players place one of their flags on each of the 5 special ability spaces. Then, players take turns removing any one of their flags from a special ability and placing it onto the board. 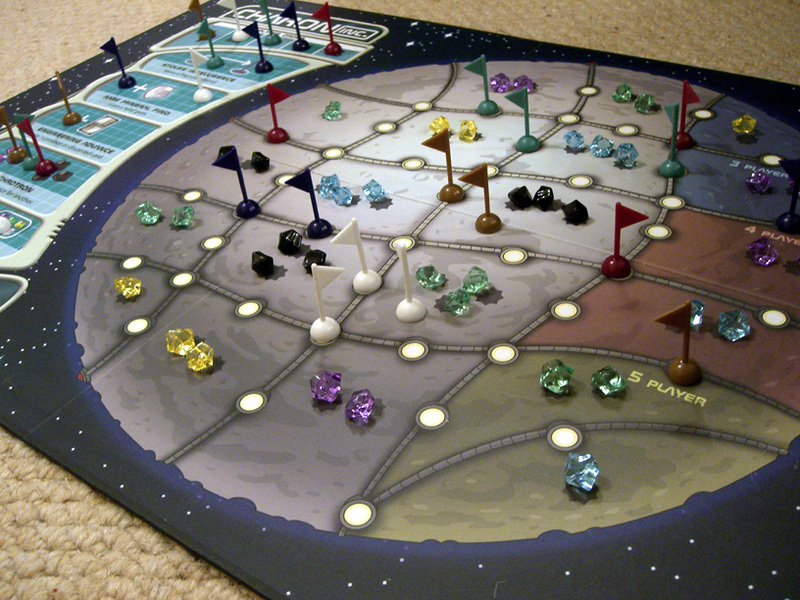 The moon is divided into a grid with gems placed in the areas (gem colours in each area are random but the quantities are fixed). A player can place their flag on any empty corner, side or centre of an area. When players have placed all but 1 of their flags, the player with the most control over each area gets the gems in that area. Control is determined by who has the most flags around and in that area – if there is a tie, a player with a flag in the centre wins, then the player with the most flags along the sides, and then the player with the most flags in the corners. Flag placement is the key mechanic of the game which has a very nice balance: Corner flags influence multiple areas but are weakest in ties; whereas, a flag in an area’s centre wins ties but only affects one area. It’s a very simple system but continually creates some entertainingly agonising decisions as to where to place your flag. Also, remember the last flag still on the special ability spaces? The other game mechanic I like a great deal is that if only 1 player (2 in a 4- or 5-player game) has a flag left on a special ability space then they can use that special ability. So, working out which flags to remove (and predicting which ones opponents will remove) to ensure you use the ability you want adds some extra thinking too. Special abilities range from taking an extra ‘wild’ gem, re-positioning a flag, exchanging one colour of gems for another, etc. which all offer strong advantages. It’s often a difficult choice especially as the gems you aim to win affects which power you’ll want, and vice versa. Gems are used to build buildings (cards). Each type of building is worth 2 – 12 VPs and players can only build one of each value. The higher the VPs, the more gems required to build it and each card states the exact colours and quantities required. Players can only carry 2 gems into the next round (6 with the warehouse ability). Players can build any of several common face-up cards and/or any cards from their hand. This mixture works nicely to ensure that players have some, but not full, information about their opponents’ potential goals which ensures players can try to disrupt other players but not with total certainty. The components are very nice (plastic gems and little flags) plus I like the way the game scales using fewer areas with fewer players. Originally when I read the rules, I wasn’t sure about the theme but it works fine and the special abilities are well-framed to be on-theme too. Overall, Charon Inc is a great, tactical, area control game with some fresh feeling mechanics to deliver an engrossing yet simple game where you will find yourself torn between what to do more often than not. Players prone to analysis paralysis may need to be nudged along but the game plays fast (5 rounds of 4 flag places each turn). As it’s almost certain that other players will trample all over the optimistic plans you had at the start of a round, you need to keep re-assessing what gems you should try to collect so you’ll have building options at the end of the round. It’s possible to end up with very few gems after a round purely because two or more players start contesting areas you are involved in which can feel like you got very little but through no fault of your own; however, all players seemed to have a fairly even share of this happening to them and it just highlighted the need to pick your battles. My only main gameplay criticism is that building takes place in turn order which is determined by who has the most gems after collecting them and that gives the first player a major advantage (because cards aren’t replaced until the end of the round). My issue with this is that the person with the most gems is already in the strongest position and is now in a stronger position by having first pick of buildings too. I think I would prefer it if turn order was determined by fewest gems so players receiving the least gems get first building choice (or even do it in reverse VP order to act as a catch-up mechanism). It’s not a major issue (especially as you usually have some cards in hand too) but this could give more balance (and stops gem-rich players building/removing cheaper common cards before poorer players get a chance). With 5 players, it’s not easy to quickly calculate what gems each player will earn during a round so you can factor that in to your placement (I expect it’s more precise with 2 or 3 players), but you can always see the VPs to know whose winning and losing. The rules are short and simple although they could be slightly more clearly ordered. For example, a turn order reference showing when each of the special abilities take place would be good, rather than each ability described in different places. These are all minor issues though. 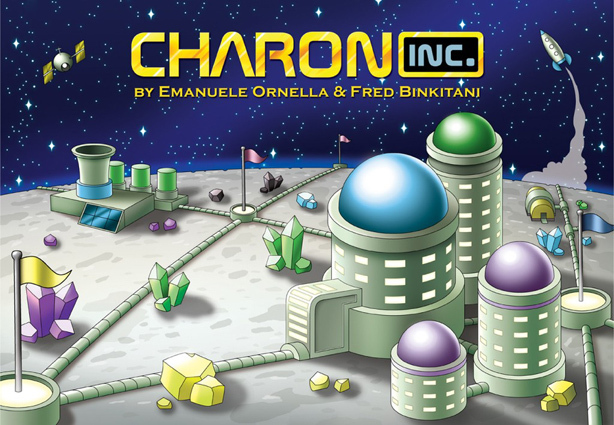 Charon Inc is a solid Eurogame that, whilst simple, will tax your decision-making, cause various groans and shouts of “stay off my land”, and still play quickly. This entry was posted on Wednesday, January 26th, 2011 at 12:03 pm	and is filed under Board Game Review, Board Games, Charon Inc, Essen Spiel 10. You can follow any responses to this entry through the RSS 2.0 feed. You can leave a response, or trackback from your own site.